e special and personal attention given me on that day made the celebration singular. Looking back, the celebratory experiences of childhood seem appropriate. With the three exceptions, my sixtieth birthday, seventy-fifth, and recently my eightieth, I have not paid as much attention to birthdays in my adult years. Celebrating my sixtieth with my twin brother and old friends in Maryland was poignant. I celebrated my seventy-fifth in Paris where people sang Happy Birthday as I floated on the River Seine. Observing my eightieth here among parish friends I realized I had attained the rank of an elderly gentleman. Many refer to Pentecost as the Church’s birthday. To celebrate this important event congregations hold birthday parties with cake, ice cream, and balloons. Recently, a pastor announced in the newspaper that on Pentecost Sunday he wanted everyone in his congregation to come to church wearing party hats. This, of course, seemed good natured and humorous and reinforced the pastor’s image as a fun-sort-of-guy. No doubt his congregation participated with great gusto. Nevertheless, wearing party hats on Pentecost does seem frivolous. Frivolity has its place but it often overtakes the true meaning of the times, or events, or important news. Epiphany, Easter, and Pentecost. The meanings of Christmas and Easter are mostly lost to the general public in commercialization. Therefore, Christians must not trivialize Pentecost by sublimation, reducing its importance to a childish party. Reducing Pentecost to the simplicity of calling it the Church’s birthday more investigation. in the world—it was our beginning. The Apostles, already commissioned and ordained by Christ, hovered fearfully in a secret room where they meditated on their experiences with Jesus then realizing on Pentecost Day they had their orders; they had to continue the ministry already begun by Jesus. They could not be apostles—those who are sent out—hiding in a secret room. So, let’s investigate. What actually happened on that day of Pentecost? To whom were the apostles preaching? Why did such a crowd of diverse people gather? The story told in the Acts of the Apostles is a mysterious event. A strong wind, accompanied by tongues of fire, moved the Apostles out of their lethargy. They were praying and conferring in a secret room in an unknown house on an unknown street. Suddenly, they all rushed out and began preaching. If anybody did exactly that today, the local citizenry would be unhappy. The scene might include police in riot gear, an unpleasant traffic jam, and some angry men with pitchforks marching the fanatics to jail. Fortunately, the Apostles were not jailed, people were not angry, and many listened. Pentecost is a Greek word for the Jewish Festival of Weeks, called Shavuot. The Festival of Weeks occurs fifty days after Passover and recalls the story of Moses carrying the law down from Mount Sinai. Additionally, Shavuot is a day of thanksgiving for the spring harvest. Probably because this is a joyful celebration, people encountering the newly energized Apostles were in a celebratory mood and ready to hear the good news of Jesus. Some maintain the Apostles were speaking in tongues, but more than likely it was another form of glossolalia, which is the formal word to describe speaking in a language not native to the speaker, or praying, or singing in an unknown language. The Scripture reports everyone was amazed that all understood what the Apostles were saying. Obviously, many there on the temple mount in Jerusalem found the apostolic message compelling and some may have even been familiar with the events fifty days earlier. Nonetheless, this was a dramatic change. The Apostles honored their calling—those sent to proclaim the Gospel of Christ Jesus. What is the message of Pentecost for us today? Is the message about ecstatic experiences, strange visions, and speaking in tongues? 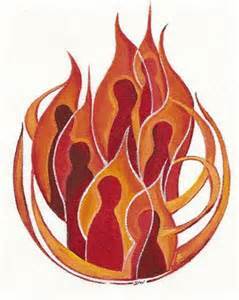 Are Christians required sit in a secret room waiting for the miracle of flames overhead and a powerful wind to wake them to their apostolic ministries? And think about this: do we have to wait for exciting things to happen to experience the power of God’s love? Most miracles do not come with powerful winds but with the silent tears of the prayerful. Christians do not need miracles and strange visions and tongues to meet their calling to apostolic ministry. Christians only need to see that the mission continues. God still needs Apostles and Christians have the model before them in the Scriptures for this work. The model is fearlessness in proclaiming the love and God and the Good news of Jesus Christ. The Acts of the Apostles, Chapter 2.
 pentekoste (hemera) “fiftieth (day),” fem. of pentekostos, from pentekonta “fifty,” from pente “five”. The Hellenic name for the Old Testament Feast of Weeks, a Jewish harvest festival observed on 50th day of the Omer (see Leviticus 23:16).